In memoQ, you can change most keyboard shortcuts. The keyboard shortcuts are grouped in categories. In the Customize memoQ shortcuts window, you can edit shortcuts directly. To customize keyboard shortcuts, you need to edit a keyboard shortcut set. Can't change default shortcuts: First, make a copy of the default set. Then edit the copy, and make it active. On the Quick access toolbar (in the top left corner of the memoQ window), click Options . In the Options window, choose Keyboard shortcuts. In the list, select a keyboard shortcut set. Click Edit. Can't edit the Default shortcut set: If the list has the Default shortcut set only: Select it, and click Clone. Clone it or create a new one before editing. The Clone keyboard shortcut set into a new resource window appears. Type a name for the new shortcut set. Click OK. In the Keyboard shortcuts list, select the new shortcut set. Click Edit. The window has a list of commands where you can change the keyboard shortcut keys. To find a command: First, you need to find the category it's in. To expand a category, click its name. To collapse a category, click the category name again. To find a command by name: At the top, type part of the name in the Search commands box. To change a keyboard shortcut: Select the command. Click the Edit (pencil) icon. To save the new shortcut: Click the plus sign next to the box. Do not press Enter to save the shortcut. Careful with shortcuts that are already taken: If the shortcut you press is already assigned to another command, and you save it nevertheless: It will be removed from the original command. To remove a keyboard shortcut: Select the command. Click the red X next to it. Cannot edit the list: The list of commands is fixed, you cannot add or remove items on it. In the Help pages, you find the default keyboard shortcuts. If you change them, the Help pages won't be true anymore. To remember the new keyboard shortcuts, you can save a cheat sheet. memoQ saves a HTML file that opens in your web browser. You can use the file from the screen, or you can print it. A Save as window appears. Find a folder for the file, and give it a name. Click Save. Save on cloud: To make the file available everywhere, save it to cloud storage (Dropbox, OneDrive, Google Drive etc.). Or, send it to yourself in an e-mail, and mark it for follow-up. In Windows, open File Explorer. Find the folder and the file, and double-click it. It opens in your default web browser. To use keyboard shortcuts for characters and symbols: At the bottom of the Customize memoQ shortcuts window, click Special characters. The Customize symbol shortcuts window appears. 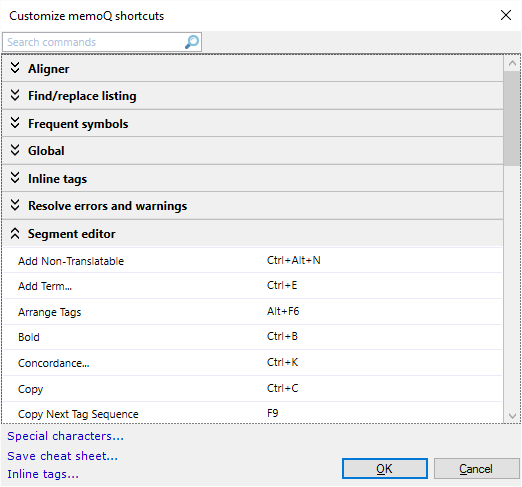 To use keyboard shortcuts for inline tags: At the bottom of the Customize memoQ shortcuts window, click Inline tags. The Customize tag shortcuts window appears. Activate the shortcut set after editing: After you edit the shortcut set, make sure you make it active in the Keyboard shortcuts pane: check the check box to the left of its name. To save the changes in the shortcuts, and return to Options: Click OK.
To return to Options, and not save the changes: Click Cancel. Don't forget to activate the new shortcuts: After you save the shortcuts, the Options window returns. In the Keyboard shortcuts pane, check the check box of the shortcut set you just customized. The new shortcuts will work all over memoQ, in every project.